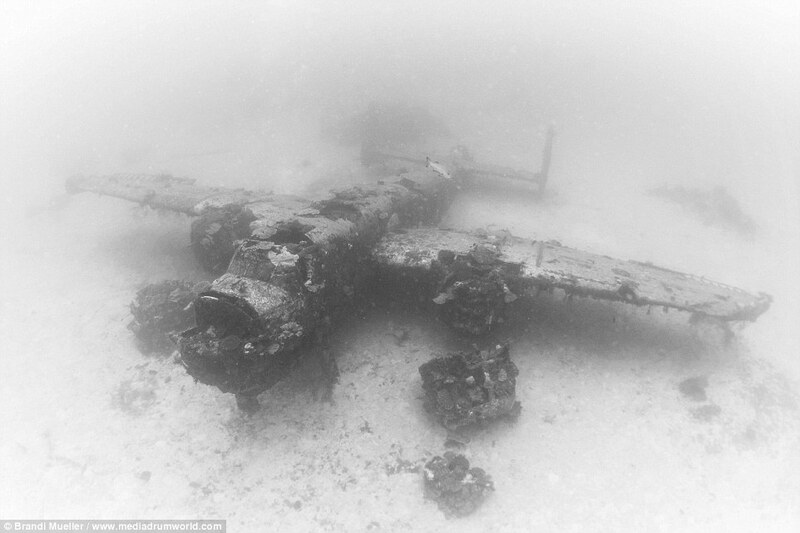 These haunting images show forgotten US planes from the Second World War lying on the ocean floor. The pictures reveal how marine life has taken over these once deadly weapons. One image even shows how schools of fish have been making themselves at home inside a rusted cockpit. American photographer and scuba instructor Brandi Mueller, 32, captured the images when diving off of the coast of Roi-Namur, Marshall Islands. The wrecked planes include the B-25 Mitchell bomber and a Curtiss C-46 aircraft. he said: 'Diving these wrecks feels like going back in time. I want to show what the wrecks have become. 'They have been underwater for over 70 years now and are beginning to deteriorate, so it sort of feels like I’m documenting them as they change. 'Eventually there won't be anything left of them.' The Marshall Islands were the setting for the Battle of Kwajalein when the United States launched an attack against the Japanese. The island was the first of the Japanese islands to be successfully captured by the US. The battle took place between January 31 and February 3, 1944. However, many of the planes that remain were mysteriously dumped by the US government after hostilities with the Japanese ceased.